In Ocean View Park on a Sunday afternoon, the high lilting tones of fiddle, banjo, guitar and singing voices can be heard floating on the breeze. Four circles of musicians face each other furiously plucking, strumming, and sawing the strings of their instruments. Some of the children playing in the park stop what they are doing and come to dance. 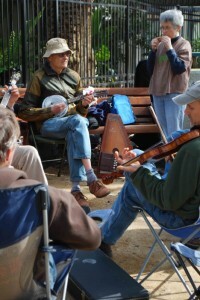 It is a bluegrass and old-time jam session, and everyone who has a thing for folk music is welcome to join in. 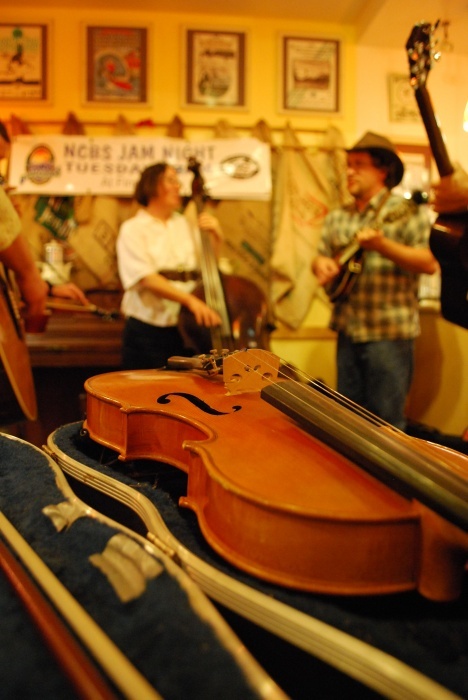 Santa Cruz has a thriving bluegrass community made up of those who have assembled this Sunday. They are an eclectic and welcoming bunch, having come together simply through the love of playing with others. They talk about their favorite bands and songs, make good-natured banjo jokes, and adjust their circles to let others in and make sure no one gets a fiddle bow in the eye. Jessica Evans, who helps organize the jam, is impatient to start playing. She suggests a song to a banjo player, who knows the tune but can’t remember exactly how to play it. Some of these songs are as old as the hills and hollers where the music made its home. The tunes may have been passed down through the generations or rediscovered from an old Alan Lomax collection. Bluegrass encompasses a great body of music — from “Soldier’s Joy,” a toe-tapping fiddle tune, to “Little Sadie,” a haunting murder ballad. The names of the original authors of these songs have been lost to time. Jeff Place, musical archivist for the Smithsonian Center for Folklife and Cultural Heritage, explained that bluegrass finds its roots in old-time music as well as the folk traditions of many different groups of people. Bill Monroe took inspiration from folk songs, old-time string bands and baptist hymnals to create his entirely new genre. The name “bluegrass” comes from the name of his band, the Blue Grass Boys, which he founded in 1939. Place explained the tremendous impact Monroe had on American folk music. Currently, bluegrass comes in many different forms, as musicians perform the songs with their own style and bring them to new audiences. Nirvana’s “In the Pines,” Feist’s “Sea-Lion Woman,” and Dolly Parton’s “Silver Dagger” are all examples of how diverse artists find inspiration in old folk songs and reinvent them to keep the music relevant. Place explained that despite having firm roots in the past, bluegrass is constantly evolving. In the third and final class of the Mountain Music Workshop, 10 students file into Harvey West Club Room and begin tuning their banjos, fiddles and guitars. This is no average music class — the students have learned all that they know not by rote, but by simply listening and playing together. “Some of them are brand new to their instruments!” Leslie Abbott said excitedly. The Mountain Music Workshop is taught twice a year by the Abbott family, and tonight Leslie Abbott and her son Luke lead the lesson. Luke is confident that his protegés are ready to lead the jam while he sits back and facilitates. “Who wants to lead the first song?” Luke asks. Some of the students are clearly uneasy at this prospect, and his question is met by nervous laughter and glances around the room. One brave woman with her guitar steps up and suggests playing “Handsome Molly” in the key of G. In bluegrass, breaks between the singing give the instrumentalists a chance to showcase their talent and style. The first break in “Handsome Molly” is quiet and timid, but by the second round, the melody shines through. The voices get louder as the musicians gain confidence, and after a few more verses and breaks, the leader kicks out her foot to signal the end of the song. The Abbott family is clearly onto something. In only three two-hour sessions, the students — most of them brand-new to their instruments — are now able to play multiple songs while singing. It’s no easy feat for bluegrass veterans, let alone newcomers. Luke Abbott is only in his 20s, and when asked how many instruments he plays, he shrugs and smiles. Remarkably, Luke has never taken any formal lessons. Instead he is self-taught, learning by ear and intuition. Luke explained the Toneway method. Luke added that those who are convinced they have no musical ability can still benefit using the Toneway method. The Mountain Music Workshop is proof that the Toneway method works. In the course of only three classes, the Abbotts have given their students the tools they need not only to play music, but to jam with others. 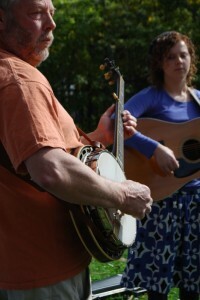 Those playing in the park this Sunday were drawn to bluegrass for different reasons. Some felt a calling, others were raised around it, some learned by rote, others by ear. All of them know that in order to continue learning and growing as musicians, playing with others is essential. 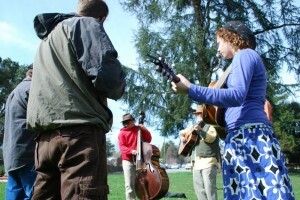 In 2008, Jessica Evans, a local musician and board member of the Northern California Bluegrass Society, organized a monthly jam session in Ocean View Park that takes place on the fourth Sunday of every month. Along with a little help from her friend Shirley Tudor and the Abbott family, Evans coordinated the jam to include any Santa Cruz musicians who were interested in playing together. Mike Bell, with his wolf-shirt and custom guitar strap, is a regular on the jam session circuit. He attends jam sessions three days out of the week as well as on the first and fourth Sunday of each month. Bell talked excitedly about up-and-coming bands and artists, praising the talent present at jam sessions. Bell experiences a real joy from playing with others. To him, music is central to living a happy, well-rounded life. 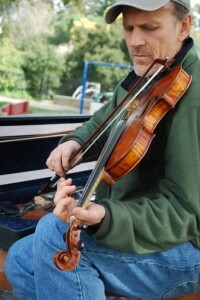 Chip Curry is the editor of The Fiddler’s Rag, a monthly magazine produced by the Santa Clara Valley Fiddlers’ Association. He grew up in a musical family listening to bluegrass and old-time songs. It is his first time playing at the Santa Cruz jam session. 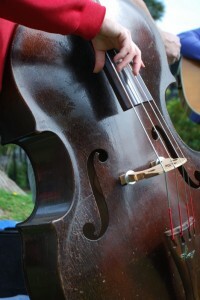 At the jam session, many of the artists play more than one instrument. They switch between them, depending on which one they are in the mood to play during each song. The shadows begin to grow longer at Ocean View Park, the day grows colder, and the sun begins to set. The musicians pack up their instruments, leaving with the promise to meet at the next jam.